and tax fairness. 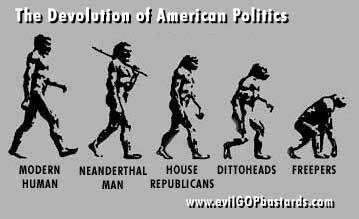 No political party could remain so consistently wrong by accident. in favor of oligarchic and corporate interests and absolutist religious groups. Why? Because they're evil GOP bastards! a citation, if possible) why your pick deserves this dubious distinction. � 2002 evilGOPbastards.com -- All rights reserved. Material herein (text and graphics) may be used for non-commercial purposes so long as they are unedited or unaltered, and the source, evilGOPbastards.com, is attributed. soley on the basis of right-wing ideology, as demonstrated by his unprecedented decision in Bush v. Gore. It is rumored that Rehnquist will be retiring soon. We should take comfort in the fact that Bush couldn't possibly appoint a worse replacement. 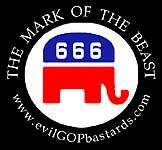 Support evilGOPbastards.com by using this link to purchase books and other merchandise from Amazon.com, or make a donation using the link at right. card of Evil" as well as other great content. Vox Populi - Our readers speak out! pathies in "polite" company. While Frist may be more circumspect about his racial policies, his voting record is indistinguishable from Lott's. was a loyal foot soldier in George W. Bush's jihad against ordinary Americans. Like everything else about the Bush administration, policy was driven by politics. Suburban white males and soccer moms (and much later, the press) might conclude that not only was Lott sympathetic to the concept of racial segregation (if not slavery), but the majority of Republican senators that elected him their leader must either share his views (which were so often repeated that nobody could plead ignorance of Lott's sympathies), or were at the very least "comfortable" with a leader that held those beliefs. 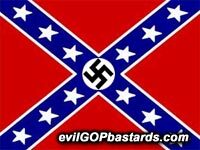 There's nothing "color blind" about GOP hostility towards civil rights legislation and the protection of minority voting rights; or their nostalgic affection for the old Confederacy -- especially as symbolized by their reverence for the Confederate battle flag. Can anyone who lived through the turbulent era of civil rights reform in the 50s and 60s deny that the Confederate flag was (and remains) the standard of racist, white-supremacist opposition to equal rights? to deny civil liberties based on race) solidly winning the Deep South -- which it holds to this day. 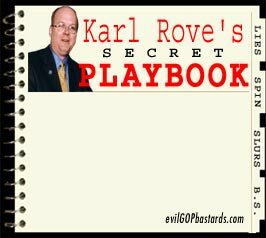 While Karl Rove's skillful surgical excision of Trent Lott has removed the daily media reaffirmation of the connection between the Republican Party and racism, the racist core of the GOP remains in power, hidden in plain view from daily media exposure while occupying the highest offices in the nation and manning the levers of government. tiation can click here, here, and here. Most disturbing is that some of the highest officeholders of the American government whom are in charge of protecting Constitutional liberties and enforcing civil rights have demonstrably racist pasts. Consider two prominent Republican officials: Chief Justice of the Supreme Court William Rehnquist, and Attorney General John Ashcroft. William Rehnquist began his career as a GOP operative by harassing black voters during the 1964 presidential election. He left a lengthy paper trail of his pro-segregation ideology as an assistant attorney general in the Nixon administration -- attempting to limit and disrupt the landmark desegregation case Brown v. Board of Education. Having thus proved himself "reliable," Rehnquist was appointed to the Supreme Court by Richard Nixon. And reliable he has been -- so reliable, in fact, that he was appointed chief justice by an admiring Ronald Reagan (himself no stranger to playing the "Welfare Queen" race card). Rehnquist's consistent "states rights" judgments (including his grossly inconsistent vote in Bush v. Gore) on the Supreme Court prove just how predictably "reliable" he has been. Can this man be trusted to interpret the law fairly? 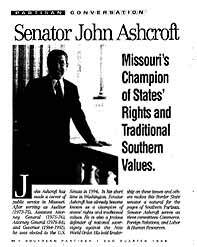 John Ashcroft, whose religious practices include anointing himself with oil (this is a head-scratcher even among our devout Christian friends) opposed racial integration and the appointment of African Americans to public office as Missouri attorney general and governor. During this period, Ashcroft maintained links to the segregationist Council of Concerned Citizens (successor to the more overt White Citizens Councils) -- even intervening in the case of a CCC member accused of plotting the murder of an FBI agent. Like Trent Lott, Ashcroft has also made his wistful pro-Confederacy sympathies known in the pages of Southern Partisan. Can this man be trusted with enforcing the nation's civil rights laws? While his appointment made the GOP's theocratic and segregationist constituencies happy, what does Ashcroft's selection as the highest law-enforcement officer in the land say about the ethics of his boss, George W. Bush? as anything other than official GOP policy. disallow the GOP's usual excuses of "misstatement"
Need proof that the Republicans are evil bastards? The GOP grand conspiracy begins: the abolition of the "Fairness Doctrine"
John Ashcroft, like Trent Lott, granted an interview to Southern Partisan, a magazine that glorifies treasonous southern racists (CSA).